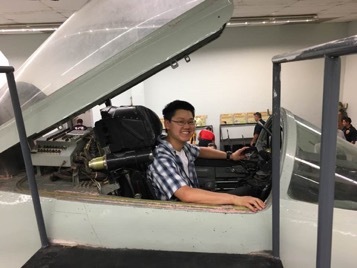 Derek Jung, a doctoral student in the National Science Foundation’s Mathematical Sciences Graduate Internship Program, takes a break from research to visit Nellis Air Force Base in Nevada. A blurred image may be a simple nuisance to photographers and every-day social media enthusiasts, but when placed in the context of national security, a blurry image becomes much more serious. Identifying unknown sensitive materials captured in photographs is an essential part of national security efforts, and research designed to deblur images is vitally important. Derek Jung, a doctoral student in mathematics at the University of Illinois at Urbana-Champaign, was tasked with finding a solution that could deblur images. His research was made possible through the National Science Foundation’s (NSF) Mathematical Sciences Graduate Internship (MSGI) Program. The program provides research opportunities for mathematical sciences doctoral students to participate in internships at federal national laboratories, industries and other facilities. NSF MSGI seeks to provide hands-on experience for the use of mathematics in a nonacademic setting. “I do mathematics because it helps me to grow personally and build relationships. I’m allowed to think for hours about a problem, take regular walks around the campus, and I’m apparently doing my job! Solving a problem leads to pride and self-confidence, while toiling for months is accompanied by support from my peers and family,” Jung commented, reflecting on his decision to pursue mathematics. While appointed to the Nevada National Security Site’s Signal Processing and Applied Mathematics team in North Las Vegas, Jung integrated his background in mathematics with an industry environment for the first time. To develop a solution for deblurring images, Jung first sought to understand how images become blurred. With the help of his mentors, Aaron Luttman, Ph.D., and Kevin Joyce, Ph.D., Jung investigated model theories about how blurring images function, and then tried to prove their functionality with math. His research was based on measure theory, functional analysis and harmonic analysis, which are all forms of advanced calculus that seek to describe spaces. During his internship, Derek focused on key gaps in existing research. He made significant contributions to the research, advancing it to the point where it will soon be ready for publication. He continued to pursue new ideas to clarify blurry images after he returned to the University of Illinois. When he presented his research to his colleagues, one professor had a fresh perspective and suggestion. Jung went home immediately, and within an hour he had scratched out a solution to the last remaining gaps in the problem. His successful research contributes toward improving national security and efforts to find and identify sensitive materials. Luttman, Joyce and Jung plan to submit their research to the Journal of Mathematical Analysis and Applications. Jung expects to receive his doctorate in 2019, and he hopes to begin a post-doctoral position at a university. Eventually, he would like to teach at a university or become a researcher at a federal laboratory. The NSF MSGI Program is funded by NSF and administered through the U.S. Department of Energy’s (DOE) Oak Ridge Institute for Science and Education (ORISE). ORISE is managed for DOE by Oak Ridge Associated Universities.